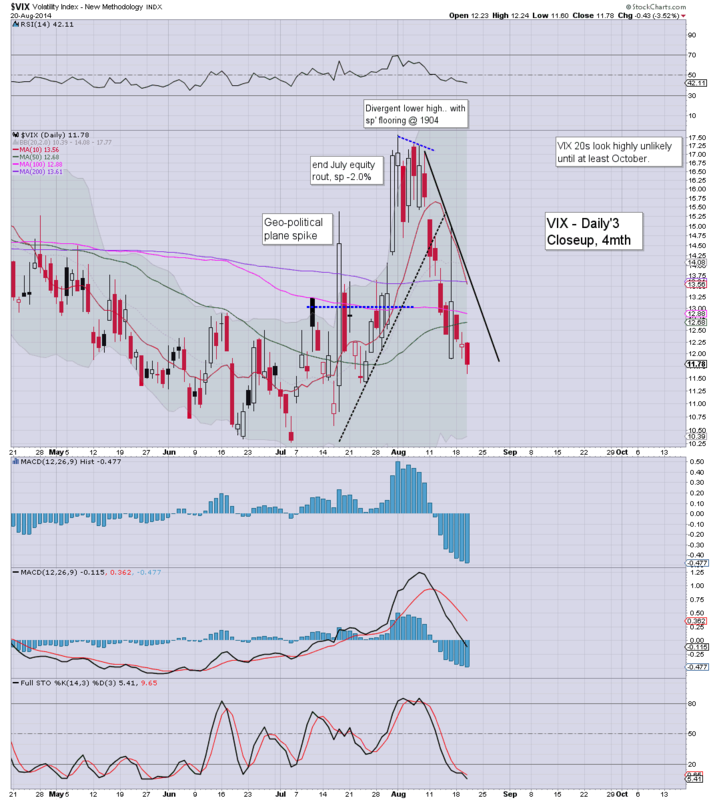 With equities continuing to melt to the upside, the VIX is naturally still on the slide, settling -3.5% @ 11.78. 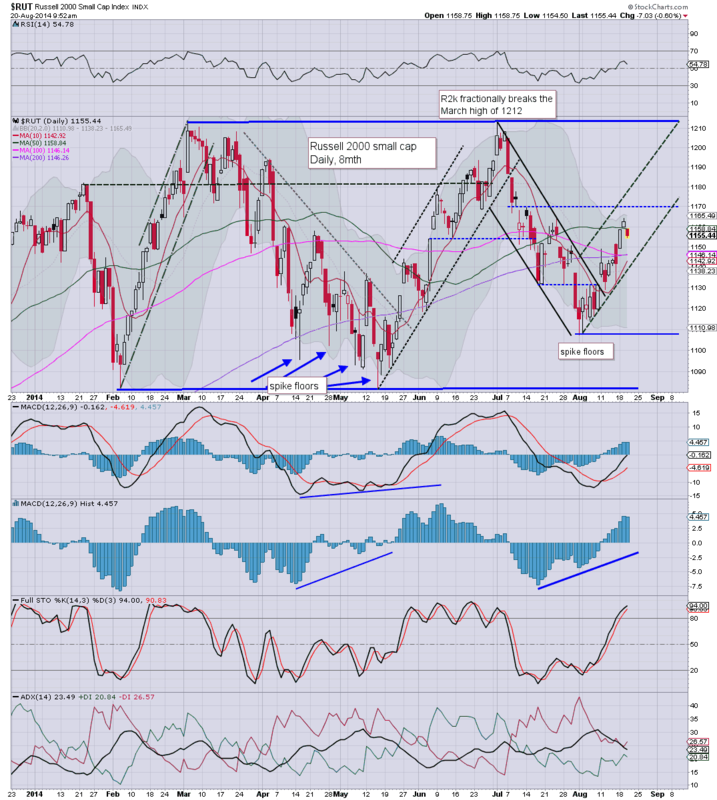 Near term outlook is for VIX 11/10 zone. The 20s look unlikely until at least October. If a minor equity down wave of 2%, then there remains an obvious VIX gap in the mid 15s. 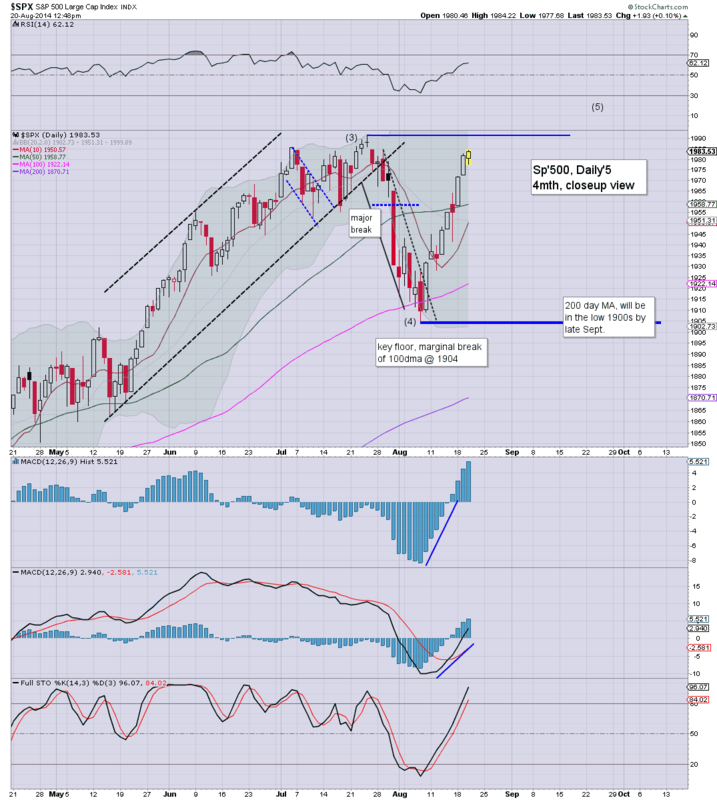 US indexes settled mostly a little higher, sp +4pts @ 1986. The two leaders - Trans/R2K, settled +0.5% and -0.4% respectively. 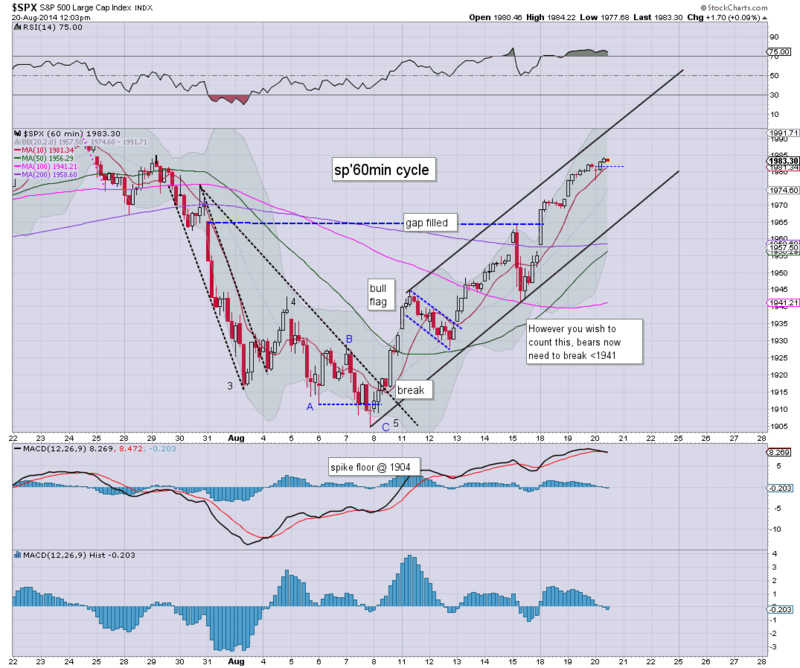 The giant sp'2000 threshold remains viable in the immediate term, before a minor 2-3 day down wave of around 2%. ...and another day of tiresome low volume algo-bot upside melt comes to a close. Where will this max out at? I usually find it damn tricky to fathom the smaller waves.. and those are always subject to sporadic news events - like last Friday. As for the rest of this week, seems high probability of 1995/2000 zone.. before next opportunity of a down wave after Jackson hole. *I remain comfortably on the sidelines. Have ZERO interest in shorting this market until sp'2030/50. Will consider another long-index position early next week, if 1960/50. Market has comfortably coped with the latest Fed press release, and it would seem there just isn't even enough downside pressure to briefly break back into the 1970s. Metals continue to slip, Gold -$5. Oil is holding moderate gains of 0.4%. I sure can't short this madness...but neither am I interested in going long at these somewhat crazy levels. *Bank of America settles for $17bn for the 'bad mortgages issue'. Too big to jail indeed. The utter irony is where the money will come from to pay the fine. I can only imagine the laughter around the boardroom table this afternoon. It is arguably a given we'll break 1991...hit 2000..and eventually 2030/50 in September. 3.42pm... nasty market...sp'1988...with VIX 11s. Again..one thing most should be able to agree on.. .this is no market for equity bears. The only safe trade is...no trade. US equities continue a disturbingly relentless algo-bot melt mode. New historic highs are viable in the sp'500 in the immediate term....with 1995/2000 certainly due by late Friday morning. ..lets see what the algo-bots make of the latest Fed press release. As things are...it looks like we'll remain in the broad upward melt mode until at least Friday morning..when Yellen is due at the hole. ...not the best of thoughts. 2.05pm.. tedious nano-chop... with a touch of downward pressure. I can't see any sig' move until the Yellen is out of the way. 2.09pm.. ohh the humanity, we're 4pts below the earlier high. Metals are notably weak, Gold -$3, but even that move is still barely above 'noise'. 2.23pm.. micro chop...hmm....there just isn't the downside power. Two gaps below...gap'2 around 1958/56... just about viable...but that still seems more likely early next week. 2.42 A real micro mess...and we're net higher this hour....why am I even moderately surprised? VIX breaking lower.. -3.4%....does not bode well for the bears. US equities remain mixed ahead of the Fed press release (due @ 2pm), with the sp +0.1%, whilst there is moderate weakness in the R2K, -0.4%. Metals are a touch weak, Gold -$2. VIX is merely stuck in the low 12s. So...Riley is looking for the 2100s...hmm, much like Carboni. I'd agree on late Sept/October downside...and my concern is that it will indeed only be a minor down wave.. rather than something dramatic. As ever...one day at a time. It remains a tiresome market to watch.. with incessant low volume algo-bot upward melt. Market is merely in a holding pattern ahead of the FOMC minutes at 2pm. Metals are starting to slip, Gold -$2. VIX looks floored in the low 12s. ..such an exciting market...I fell briefly asleep. It is notable that whilst prices continue to melt higher, the MACD (blue bar histogram) cycle has turned negative. That is very impressive. Given another 3-4 trading hours... the cycle should be ready for another up wave. Equities resume the algo-bot melt to the upside.. sp @ 1983. Hourly charts will offer 1995/2000 zone on a 'spike high' this afternoon. VIX is melting lower... -2% in the 11s. Notable continued strength in the USD, +0.2% @ 82.05. For many, this is indeed just tiresome. Nothing much to expect until 2pm.. and even then..there is threat of new historic highs. This is no market for the bears. US equities open a touch lower, with the only notable weakness in the R2K, -0.6%. Metals are flat, whilst Oil is +0.4%. Despite the equity weakness, VIX opens fractionally lower. There really isn't much to note. Market is likely to just see minor chop until 2pm. From there....difficult to say. What is clear...downside is more likely after Yellen @ Jackson Hole..than this afternoon. Good morning. Futures are moderately lower, sp -3pts, we're set to open at 1978. 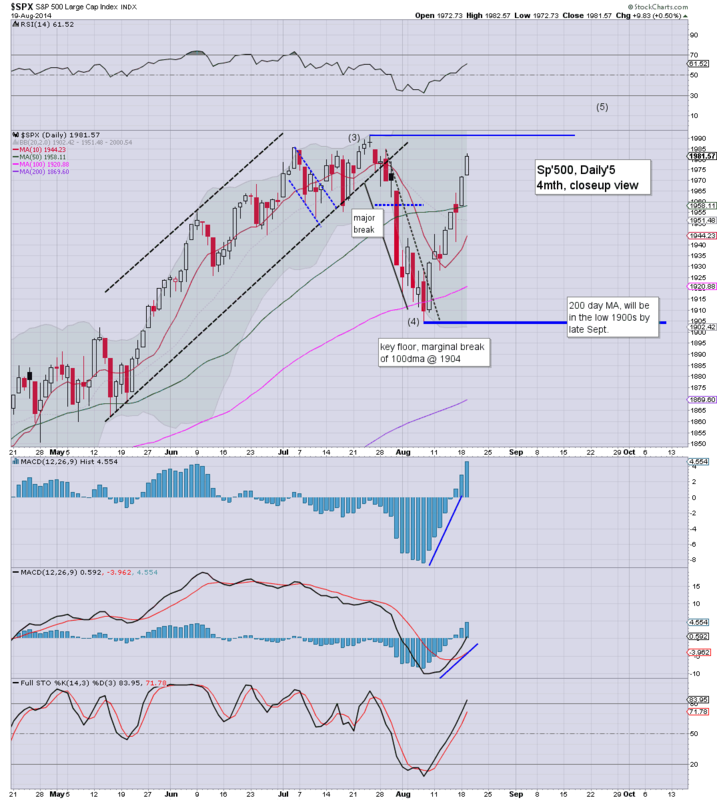 The near term trend remains pretty strong to the upside, but there will be stiff resistance in the 1990/2000 zone. Market will likely see minor chop until 2pm... when we have the Fed press release of the latest FOMC minutes. For those seeking a break of the wave from 1904, it would seem more likely to occur this Friday, when we have Yellen at Jackson Hole. Even then.. downside looks limited to 1950/45...at best, by early next week. For those traders still trying to play the short side, it remains a painful time. 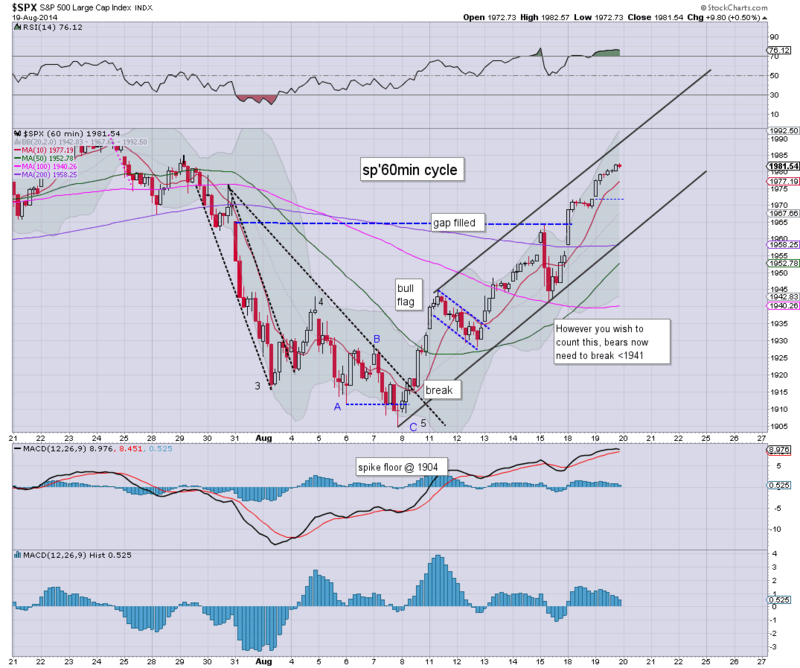 The sp'500 has climbed almost 4% since the low of Aug'7th, and with the weekly cycles back to outright bullish, there is high likelihood of the 2030/50 zone in September. The green candle just keeps on getting taller, and it is a disturbing sight.. even to yours truly. Note the upper bollinger on the weekly chart, which is offering the 2020s in the immediate term. By mid/late September, that will probably have climbed into the 2030/40s. So.. the 2050/70 zone is just about viable on a 'euphoria spike'. There is the EIA oil report.. and if supplies are higher than expected, then it will give Oil yet another kick lower. More important though, we have the FOMC minutes (2pm)... market will be sure to react on that. As always, good viewing for those with an interest in the macro-econ picture. I suppose some could sneer and say 'ohh look.. he touted upside, but he ain't long'. True, but my last two index trades were fine, and right now... at least I'm not losing money on the short side. 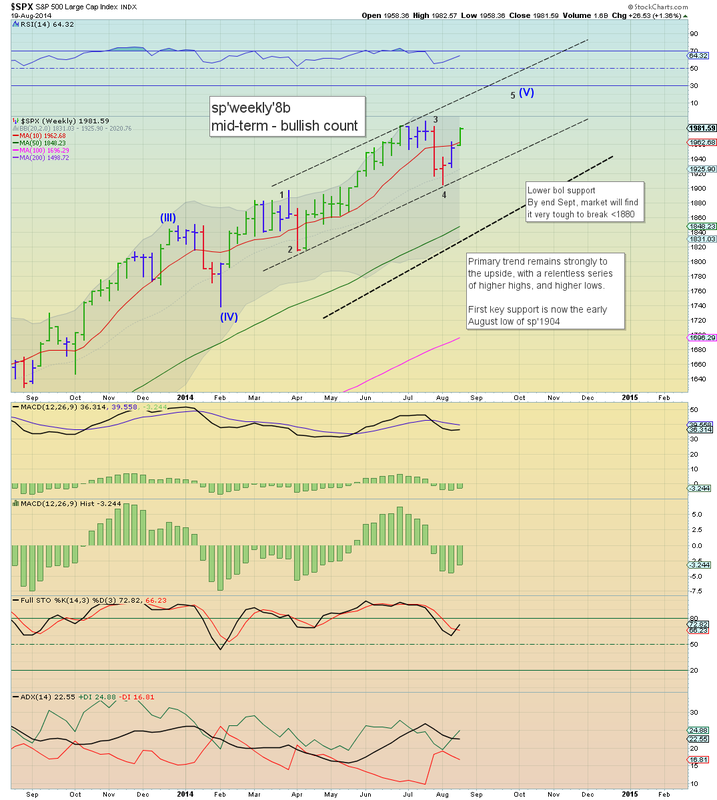 Until we get close to the upper bollinger on the giant monthly cycle - which will probably be in the 2050s in September, I have ZERO interest in meddling on the short side. Waste of time, and in my view....overly risky. Maybe we'll see a down wave after the FOMC... or Jackson hole. If so.. I'll be looking to pick up another index long, otherwise, I'm more than content to sit on the sidelines. US indexes continued to climb (6th day of 8), sp +9pts @ 1981. The two leaders - Trans/R2K, settled higher by 0.1% and 0.3% respectively. Near term outlook offers the giant sp'2000 threshold, before some degree of minor down wave. Suffice to say, the slow (but consistent) low volume algo-bot melt to the upside... continues. 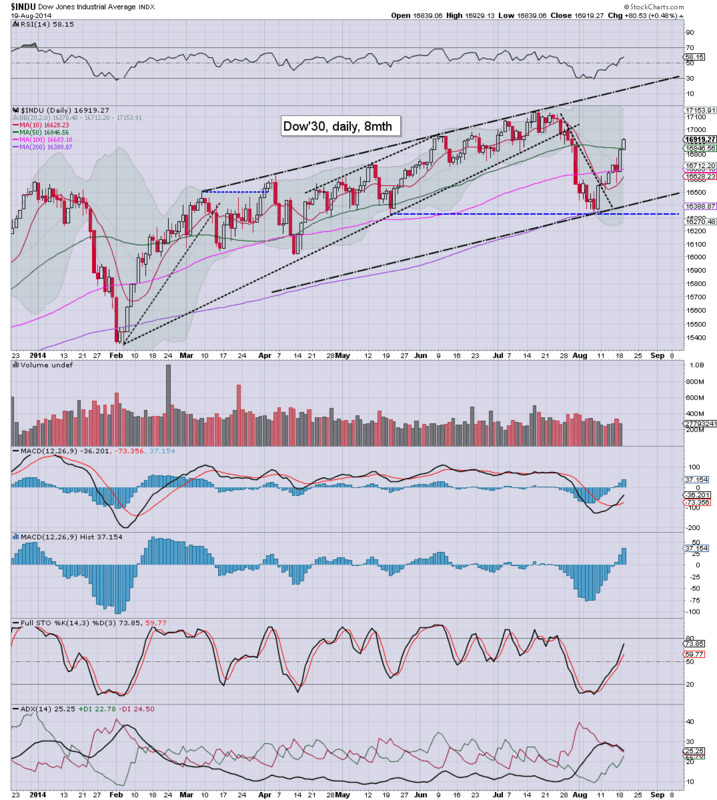 I expect new historic highs on the Dow/SP' in the near term... the laggard remains the R2K. It will be difficult to break the July high of 1213. Perhaps more importantly, I am keeping an eye on the NYSE Comp', upside target remains the 11300s in September.